What do you mean I have to run a “real” race? Democratic Gov. John Hickenlooper has watched his political fortunes rise and fall during his first term. A year ago, he might have been among the most vulnerable incumbents up for re-election after suffering losses on some of his biggest priorities. Then polling taken earlier this year indicated that his position had improved. It helped that Republicans had a crowded field of candidates…. …At this writing, polls indicate that Hickenlooper might have a race on his hands after all, particularly after botching an attempt to apologize to the state sheriffs’ association for signing several gun control measures. The upgrade comes after a recent Quinnipiac poll showed that Hickenlooper was trailing Beauprez by a point. Yes, that’s within the margin of error, but that’s awfully tight for a Governor that is “so well liked” and who was previously considered unbeatable. As we noted earlier this week, these numbers leave very little room for error. 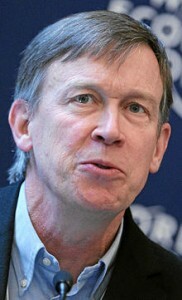 Unfortunately, Hickenlooper is terribly error prone. The poll also revealed that more people think he doesn’t deserve to be reelected (48%) than do (42%). Don’t worry, Governor, people still like you and they’d grab beers with you. It just might not be in the Governor’s mansion. Love those photo ops with Hickenlooper playing pool with Obama. That really helped him with independents, not.